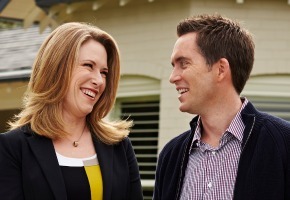 Location Location Location Australia is back for its third season next month with property experts Bryce Holdaway and Veronica Morgan. With the property market being trickier than ever, combined with nervous sellers and anxious buyers, our experts have never had to work so hard to protect these desperate buyers from getting burnt. But with over 30-years’ experience between them, Bryce and Veronica are the experts to help these buyers navigate the twists and turns of a market in overdrive and to secure the biggest single investment of their lives at the best possible price. In each episode of the ten part series, two potential home buyers have very different wish lists, so Bryce and Veronica split up and scour the country to find ideal property matches for each and negotiate the best deals whilst outsmarting the competition. With the market running hot and stress levels rising, things are going to get a little fiery. From all around Australia, Bryce and Veronica will hit all points of the compass, from heritage and iconic getaway locations to some of Australia’s richest property playgrounds. Whether upsizing, downsizing, retiring, relocating or purchasing the first family home – buying property is an emotional rollercoaster that brings out the best and worst in people and Bryce and Veronica certainly have their work cut out for them this series to turn property dreams into a reality. 8:30pm Tuesday August 12 on LifeStyle.